Did Moses Mendelssohn ever deny or affirm the coming of the Messiah? In the 150 year old sport called "What Was Wrong With Mendelssohn?" an interesting contender is that he did not believe in the coming of the Messiah. Since his religious behavior was impeccable, no one could say that he didn't put on tefillin or was not kovea ittim, but if his innermost thoughts could be revealed? Check mate. The way this is derived is from a penetrating analysis of his Chumash Nesivos Shalom's commentary, which was composed by 5 people, and anthologized from Rashi, Rashbam, Ibn Ezra, Ramban, with original exegesis by these men as well. Everyone knows that the classical exegetes interpreted verses in varied ways, sometimes agreeing and supporting one another, sometimes disagreeing. There are a number of places in the Torah where one exegete will interpret a verse in a Messianic sense, but another doesn't. So, says this analysis, when Rashi interprets one verse as referring to the Messiah, it will adopt the Rashbam who didn't. When Rashbam interprets a verse messianically, it will adopt Rashi, and in this way the Moshiach is missing from the Bi'ur. These Maskilim explained the Torah according to traditional commentaries, but what did they do? 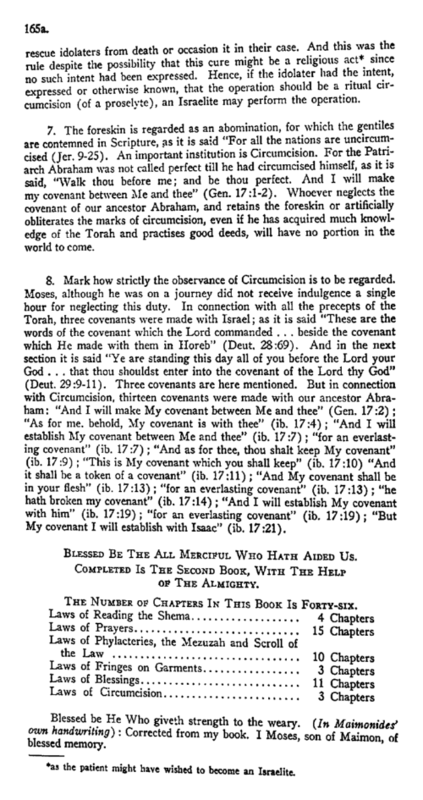 They marginalized traditional viewpoints, for example, with regards to the belief in the coming of the Messiah, Rashi interprets Gen. 49:10 to refer to the Messiah, but Rashbam interprets it as referring to another time period. On Numbers 24:17 Rashbam interprets it to refer to the Messiah, but Rashi explains it as referring to King David. Either way, there is a reference to the coming of the Messiah in the commentary of both Rashi and Rashbam. The commentators of the Bi'ur explained the first verse according to the Rashbam, and the second according to Rashi. Either way, there is no reference to the Messiah in the Bi'ur. Similarly, I am told that this is reported in the name of the 'Minsker Gadol,' R. Yeruhem Leib Perlman. In that case, the second verse cited is Deut. 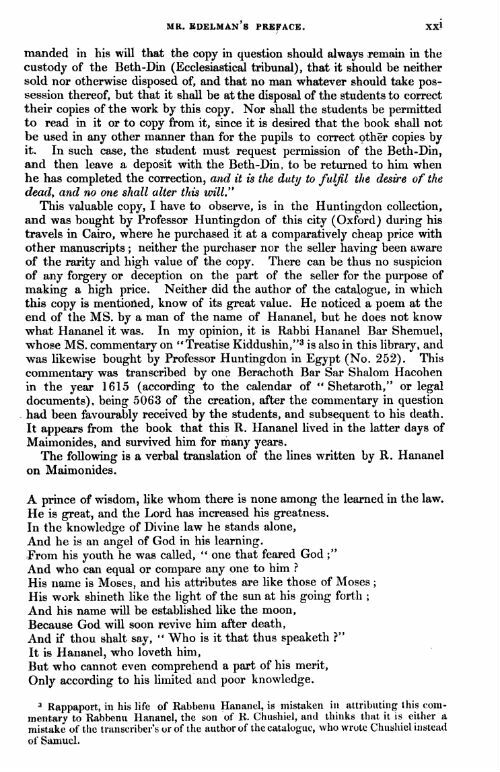 33:5, which Ramban interprets messianically, and Rashi explains it otherwise. Since it is unlikely that Rabbi Nissenbaum was the one to discover this, it's safe to assume that this was something which was noted by many, whomever first discovered it. The first question is, is this entirely accurate? Is there no reference to the Messiah in the Bi'ur? Although I have not discovered such a reference, I believe it is notable to point out that Mendelssohn specifically writes (in a paranthetical comment to Wessely in Lev. 26:39) that the Jews were exiled from their land by God for their sins. The continuing travails of the exile are natural, since sons cannot be punished for the sins of the fathers. However, only a miracle by God can restore the Jews to their land, even if the present conditions of the exile are natural, rather than supernatural. As far as I can tell this is awfully close to a reference to the coming of the Messiah, and it is literally written by Mendelssohn himself. The red brackets is his paranthetical insertion, and the arrows are the comments I wish to highlight. Putting this aside - although I believe the post could really end there - here are some objections to the original suggestion. First, five people wrote the commentary, so it is hard to see how there could be a unified policy. The first example is from Genesis, and it was written by Solomon Dubno, whom no one would accuse of not believing in the Messiah. Although I do not know enough about the author of the Numbers commentary, Aaron Freudenthal of Jaroslaw, it's is difficult to suggest that he interpreted there according to Rashi in order to ensure that there would be no reference to the Messiah in the book. Thus, we have to dismiss the suggestion that any one individual commentator interpreted his verse non-messianically because he personally did not believe in it, because this idea requires more than one verse. The only other possibility is that Mendelssohn himself is responsible for this through editorial interference. While one could posit this, one could posit anything. We should like some evidence. As we see from the Wessely example, he carefully noted where his own hand touches the commentary. Second is how loaded was the suggestion that there is no future coming of the Messiah. In his time, this could only be understood by the many, many gentile scholars looking over Mendelssohn's shoulder as meaning that the Messiah already came. This is something which surely he wished to avoid at all costs, and it is hard to say that this theme was therefore presented on purpose. Indeed, this is likely the reason why Dubno, for example, would interpret ad ki yavo shilo according to Rashbam, a verse which is given a christological interpretation. Thus it is not so understandable if the book avoids messianic interpretation, even intentionally. In the system of man's duties, the duties to God, in the main, form no distinct division. All the duties of man are duties to God, some concern ourselves, some our neighbours. Out of love of God we are rationally to love ourselves, his creatures ; out of rational love of ourselves we are bound to love our neighbours. [God] only designs our good, the good of every individual . . . This common-place is so trite, that good sense is surprised that people could ever have been of a different opinion. And yet mankind have, from the beginning, acted against those plain principles! Well will it be for them, if in the year 2240 they leave off doing so. In other words, it will be good for people if finally, in the year 2240, they will come around and stop acting against the obviously correct principles that God really wants people to be good to one another. Although I would agree that we cannot deduce his belief or lack of belief in a literal coming of the Messiah from this comment, it surely is interesting. Note 8: L'an Deux Mil Deux Cent Quarante, by Mercier. Thanks to the miracles of modern research this can be explained in 10 seconds. It refers to Mercier's 1771 book The Year 2440: A Dream If Ever There Was One (which, funnily enough, was changed to 2500 in the English edition). Wikipedia helpfully describes it as "a utopian novel set in the year 2440. . . . [it] describes the adventures of an unnamed man, who, after engaging in a heated discussion with a philosopher friend about the injustices of Paris, falls asleep and finds himself in a Paris of the future." 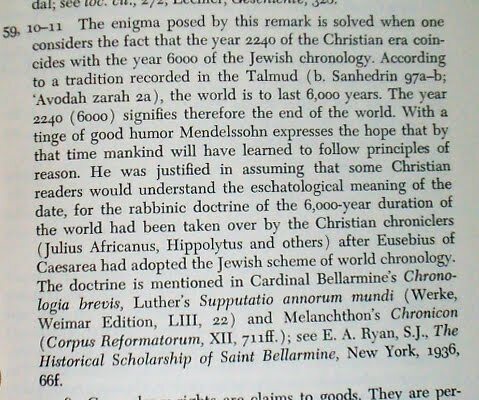 Thus, it is pretty clear that in 1783 when Jerusalem was released "the year 2440" was a well-known reference to the literati of Europe. It meant "the future." Edited 12.1.11: I was never good with numbers, and a sharp-eyed commenter pointed out that the book uses the year 2440, while Mendelssohn wrote 2240. Therefore Altmann's point (preceded by Gottlober) is stronger. While I still feel that Mendelssohn was almost certainly alluding to Mercier's book, he also changed 2440 to 2240, which is indeed the year 6000, and therefore he is alluding to the yemot ya-mashiach. Be that as it may, I ask you, is this the face of a man who didn't believe in the Messiah? What does Maccabee mean? We will never know, but it sure is fun to guess. It's almost Chanuka time, so I figured I'd post about the Maccabees. Or, more precisely, what the name may have meant. I stress that no one knows. All we have our theories, some more convincing, some less, but not proven. Have a look at the pitiful Wikipedia entry on the name (link). I once posted Ohev Ger Luzzatto's theory, as explained by his father Shadal (link). I will give it in further detail below, but first I wanted to post this little article by שזח"ה (S .J. 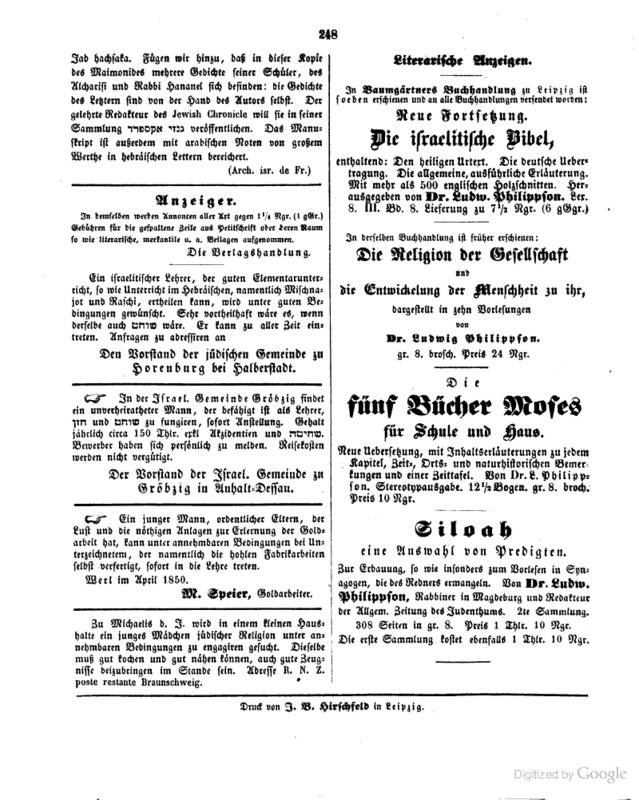 Halberstamm) in Halevanon (10 Adar 5628/ 4 March 1868). 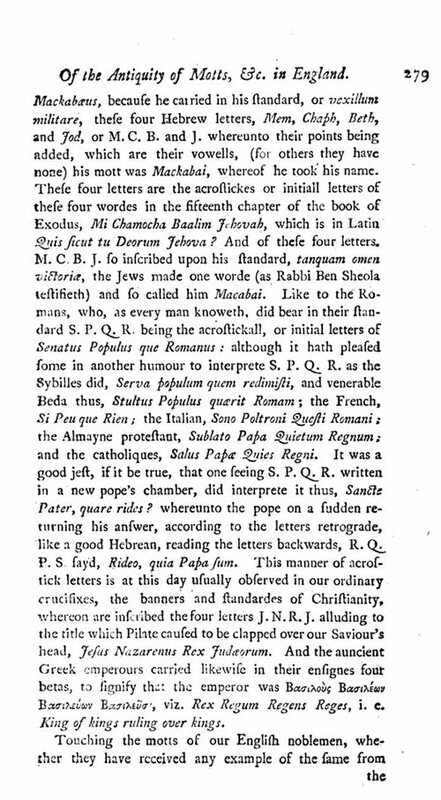 As you can see, he writes that in an earlier issue a writer had explained that 'Maccabee' is an acronym for Mattathias Cohen ben Iohannan, and he wanted to take issue with this explanation (which was accepted by the Chasam Sofer, to the point where he wanted to use it to determine the proper way of writing a get; on this see Dan's excellent post on the Seforim Blog from three years ago (link). That writer reasonably makes the point that the popular explanation that MKBY, an acronym of Mi Khamocha Be'elim Y"Y was written on their banners, is exceedingly weak, because "who saw the banner of Judah Maccabee's camp?" He gets in some snarky remarks about how he is not one of those Jews who are sloppy in their use of language, says that he is precise in his language, and then cites the language of Beyemi Matisyahu from the Chanukah prayer, and notes the previously mentioned acronym. He does not claim that this is how it is written in the prayer, only that we cannot avoid noticing that Matisyahu Cohen Ben Iohannan gives the acronym Maccabee. He relates this to the common Jewish practice of using acronyms to give one's name and father's name, and suggests that this is proof that it goes back to antiquity. As you can see, Michaelis derives it from the wrote מקב, Aramaic for hammer, a popular suggestion which is still common today (Jastrow refers to Bekhorot 43a-b, where מקבן is used to mean a physical deformity resembling a hammerhead). You can also see that Michaelis rejects the Mi Kamocha acronym, since he prefers the Syriac spelling מקבי. To this I would say that, yes, it is a good illustration of how we do not even know for sure how the term is spelled in Hebrew letters (to say nothing about whether it comes from Hebrew, Greek or Aramaic) but we also cannot over-rely on spelling. As you will see, others reject it because of other diyukkim in the Greek spelling. Here would be a good time to point out that the term does not appear in the Talmud or early rabbinic sources. Thus, the only early sources we have are Greek. We are therefore not entitled to ignore them. So Halberstamm chooses to give Ohev Ger's explanation cited in Shadal's Lezioni di Stori Giudaica in full, which is that the word maccabee was the Greek biaiomachas, meaning valiant warrior, with the letters /b/ and/m/ transposed, as happens frequently in language. Seemy original post where I delve into if and how this is a Greek word. Halberstamm is surprised that no later scholars mentioned this clever suggestion. 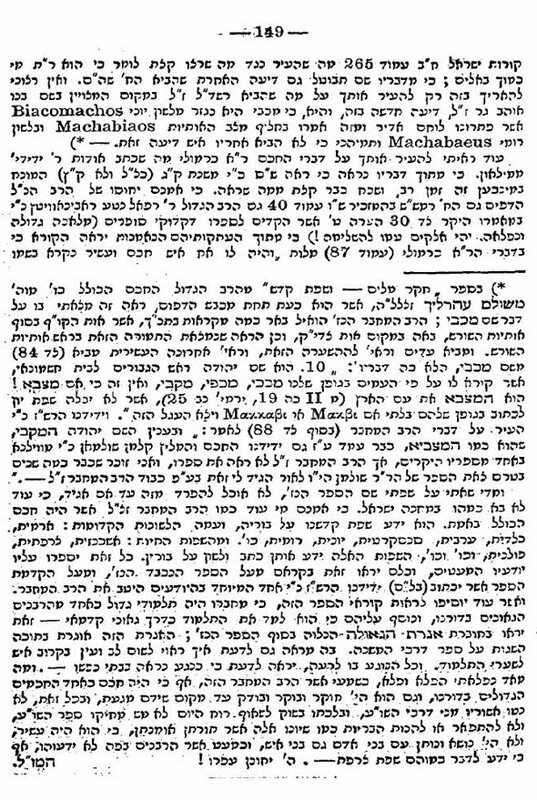 I am surprised that Halberstamm did not mention that the contention that Maccabee is a Greek word was already given as the primary reason by the 18th century Litvishe R. Yechiel Heilprin in Seder Hadoros. 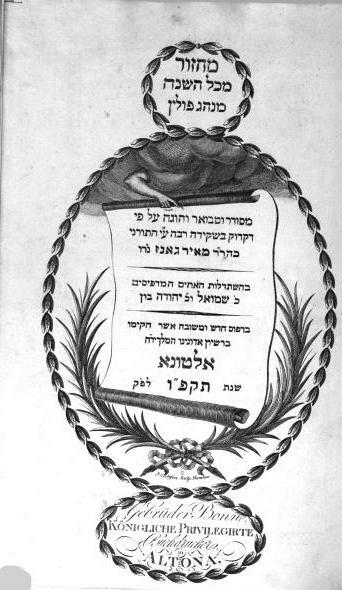 He rote (Seder Hadoros, Karlsruhe 1769, pg. 40) מכבאי בלשון יון גבור ואיש מלחמה וי"א שכך היה כתוב על דגלו ר"ת מי כמוך באלים יהוה, 'Maccabee' in Greek connotes a hero, or a warrior. Some say that it was written on their banner, an acronym of Mi Khamocha, etc." Dan pointed out that the explanation is given by R. Elazar Rokeach of Worms in his siddur (link). I have absolutely no idea of the provenance of this commentary, but if it is really his then it dates to his period, namely 1176 – 1238. What he says is that ט"א על דגל יהודה במלחמות חשמונים שנצחו ליוונים כתי' מי כמוך באלים ה' שעזרת לנו לנצח הרשע זהו שיסד הפיוט מכבי יהודה מכב"י נוטריקון מי כמוך באלים ה. The piyut to which he refers which says 'מכבי יהודה' is the yotzer for Shabbos Chanuka Odekha ki anaphta bi va-tashav. In short, it would seem that the idea that it is a notarikon for Mi Khamocha Be'elim Hashem comes from the Rokeah, or at least it is no later than him. This would fit well with this mystic's use of notarikon. It's interesting how eventually it would inspire what we might describe as a more . . . scholarly conjecture, that it stood for Matisyahu Kohen Ben Yochanan. But of course this is also entirely conjectural. There have been many other suggestions. Some adopt Michaelis's position that it refers to a hammer (in one of the Levanon excerpts above it relates it to Martel, a surname given to Charles Martel, grandfather of Charlemagne; see Rashi to Shabb. 122b - קורנס. מרטי"ל). Others suggest that Judah Machabee had this physical deformity! Still others, that he was a blacksmith. Delitzsch proposed the fun but utterly implausible idea that is is a contracted word from the rhetorical question "?מה כאבי." He compared the term to two biblical names, מכבני and מכנדבי, found in Chronicles and Ezra respectively. Since "מכ" cannot be explained, he says that it is a contraction of מה, similar to מי as used in other names, like Michael. He thus explains Machbannai to mean "Who is like my children?" and Machnadebai as "Who is like my benefactors?" Others laughed him out of the running, saying that it is a "monstrosity." One critic pointed out that in 1 Chron. 2:48 'Machbenah' is a city. "מי כאבי" might be more plausible, but that would yield 'Miccabee,' not 'Maccabee,' to which I say - not necessarily. Here's an illustration of Czar Nicholai I's soldiers carrying out one of the ukases to cut the beards and peyos (side curls) of Jews, as part of his policy of forcible Russification. 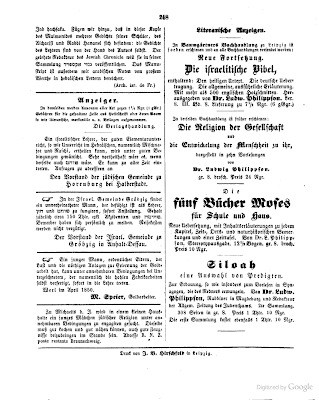 From Ost und West (1916). Eli Eshed has a really nice post about Chelm and the 16th century Rabbi Elijah, the Ba'al Shem of Chelm's golem (link). I have previously posted en passent about Rabbi Elijah, as famously referred to by Chacham Tzvi and R. Jacob Emden (link), and how they were descendents of his, not grandsons. Eli refers to a famous account of it in a letter printed in 1674 - less than a century after R. Elijah lived. I believe Gershom Scholem first called attention to this letter. I figured I would post it. It describes how the golem is created from lime for being a servant, to do housework. It is animated by writing 'Emet' (truth) on its forehead. But it keeps on growing and gets stronger. To cause it to stop, the thing to do is to erase the aleph, leaving the word 'met' (dead). He says that the Jews in Poland say that one Elias Baal Schem, the name being derived from those who practice magic using divine names, created such a golem. The problem is that the golem grew so big that he couldn't reach up and erase the aleph. So he ordered the golem to bend down and take off his boots. Upon removing the letter, the heavy golem fell onto him and crushed him. The foundational myth of Algerian Jewry, featuring the Rashbatz, as told in 1833. Here's a fascinating story told by Claude-Antoine Rozet in his famous 1833 book on Algiers. 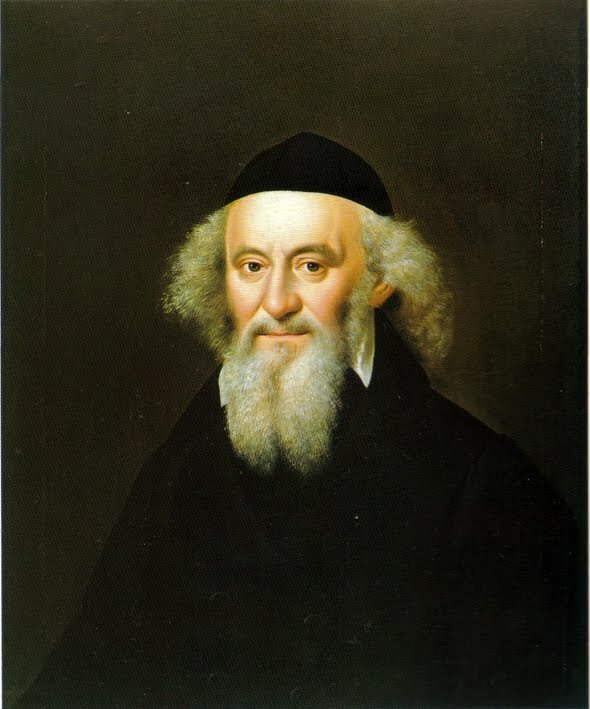 It is a legend which he heard from Jews about how their community got started from a group of Spanish exiles who arrived in 1390 led by their rabbi "Simon Ben Smia," who can only be the Rashbatz, R. Shimon ben Tzemach (1361 - 1444). The story refers to him as the rabbi of Seville, which he was not, but judging by the name it almost certainly is referring to him. He writes that Rabbi Shimon, along with 60 leading families of Spanish Jews and several Moors, were arrested by the king of Spain. About to be executed, the Rashbatz took a piece of charcoal and drew a picture of a ship on the prison wall. Addressing the despairing people, he told them that whoever believes in God should touch the wall. As soon as they (and he) did, the picture turned into a real ship, slid through the prison wall and the streets of Seville to the water and they all landed in Algiers, where they applied for and were granted asylum. "Whilst the Moors were in possession of Spain, they had allowed the Jews to establish themselves there and to occupy themselves in commerce. The people of Israel did there as in Egypt; they multiplied fast, and in a short space of time became extremely numerous. They had their magistrates, their temples, and the free exercise of their religion. When the Christians had driven the Mussulmans from Spain and reconquered that fine country, they permitted the Jews to continue to dwell there and to carry on their commercial speculations, on condition of their submitting to the laws of the new state. To the great riches which they had amassed under the empire of the Moors, they added still more, until at last the Christians became extremely jealous of them. In 1390, the chief rabbi of Seville (Simon-ben-Smia), a man of first-rate capacity, who possessed great wealth, was seized and thrown into prison by order of the king of Spain, with sixty of the principal heads of Jewish families and many Moors who had remained in that city. Immediately after this arbitrary act, the Spaniards subjected the Jews and Moors established ih the kingdom to all kinds of exactions. Soon after the imprisonment of the rabbi, the king ordered him and all who had been shut up with him to be put to death. On the evening which preceded the day appointed for the execution, at the moment when all his companions in misfortune were abandoning themselves to despair and grief, Simon took a bit of coal and drew the figure of a ship on the wall. Then turning to those around him who were weeping, he said,' Let all those who believe in God, and who are willing to quit this place immediately, put their finger with me on this ship.' They all did so, and in an instant the ship sketched with coal became a real ship, which put itself in motion; the wall opened to give a passage; it traversed Seville, to the great astonishment of the inhabitants, without running against any of them or even touching their houses, and went with all its crew direct to the sea. We are not told if the rabbi took the helm, or if his companions served as sailors; but this we are assured, that the vessel never stopped till it suddenly anchored in the bay of Algiers, a town then only inhabited by Mahometans, Moors, and Arabs. 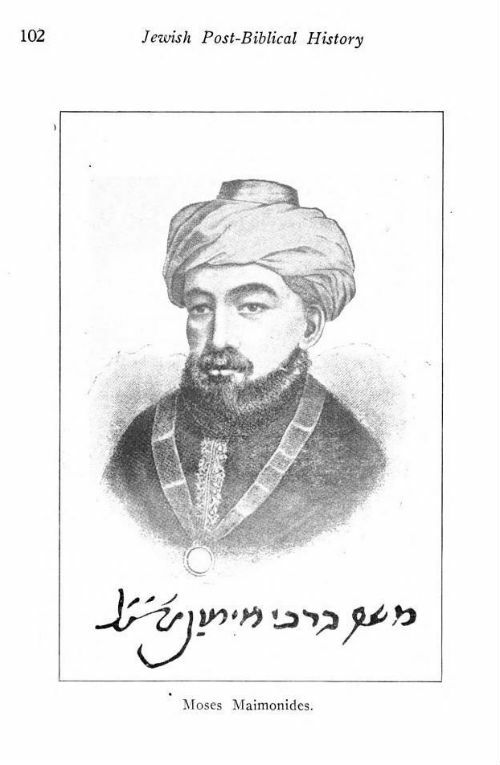 The rabbi, having dispatched in all haste some of his companions to the Algerines, to tell how they had been brought to their coast, and to solicit an asylum, the latter answered that it was no concern of theirs, but that they would consult Sydi-Ben-Yousef, a famous marabout who dwelt at Meliana. Immediately a party of horse set off at full gallop and soon arrived at the residence of Sydi-Ben-Yousef, whom they informed that certain Jews and Moors, who had escaped miraculously from Spain, had arrived in the port of Algiers, begging to be received as inhabitants of the town. Receive them and treat them in the best manner possible,' was the answer of the marabout. The messengers hastened back with the order of the holy man, and it was immediately announced to the Rabbi that he might land with all his companions. The inhabitants of the town, with the chiefs of religion and of the law at their head, marched out to meet them, and offered them every thing of which they were in need. They gave them lodgings in the town, where they settled."—vol. iii. 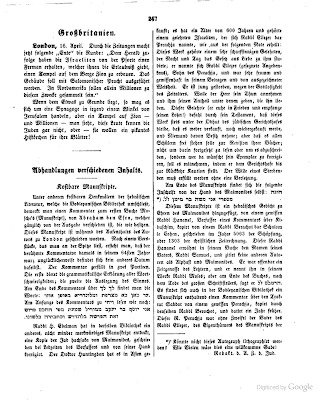 p. 210. It goes on to say that the Sydi-Ben-Youscef wrote a charter for them, enumerating their various rites, and the charter is preserved by the Jews to that day (1833). 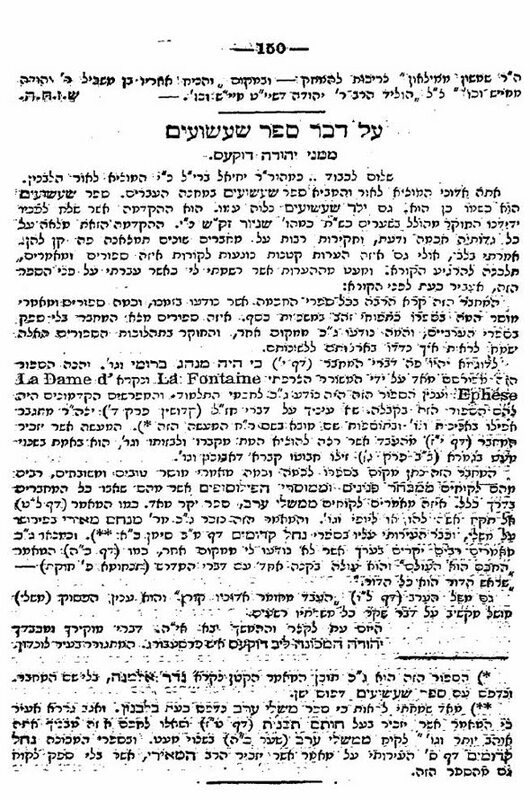 Rozet says that he wanted to laugh at the story with one of the Jews, a man who struck him as very learned, who knew several languages, including perfect French, but the man silenced him saying, "C'est un article de notre foi," "It is an article of our faith." The Jewish Jimi Hendrix of the 1830s. 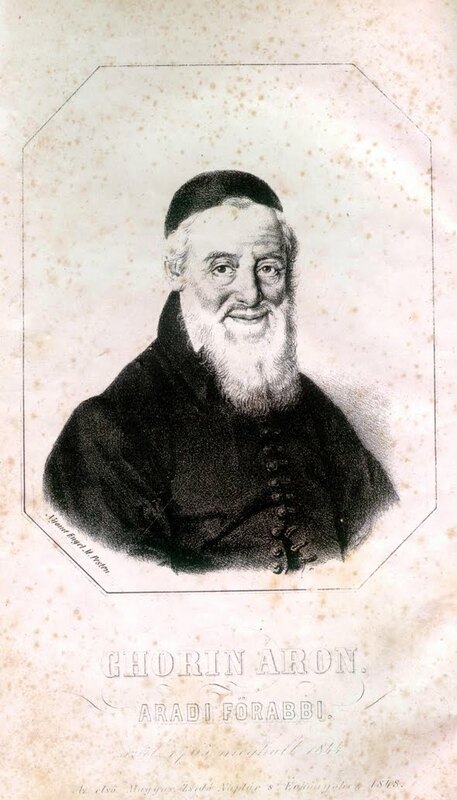 Mikhl Yosef Gusikow (1806-1837), a Klezmer musician from Shklov, became a musical sensation in Germany and France in the 1830s, playing a musical instrument allegedly of his own invention. His exotic image, lack of formal training, primitive instrument, as well as his musical virtuosity, made a strong impression, not unlike the person mentioned in the post title (although there was nothing primitive about a Fender Strat). Or maybe a comparison to Django Reinhardt is more apt. I guess that's mid-19th century German slang; he was a Mordkerl ("a killing fellow"). Do people still say "killer musician"? I guess "shortly after 30" was the 27 of the 19th-century. His instrument, the Strohfiedel ('straw fiddle') was basically a kind of xylophone. He allegedly invented it, but the truth about that appears to be more complex. Originally posted as a guest post here. 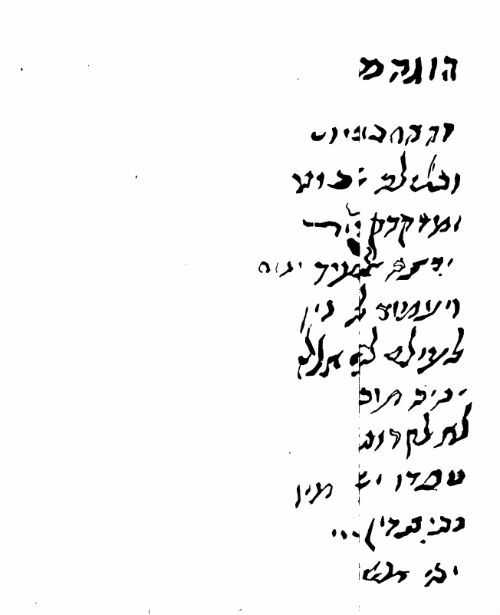 I would wager that most of us are familiar, or vaguely familiar with, a sample of the Rambam's handwriting. Numerous fragments in his own hand were recovered from the Cairo Genizah (see here for many). 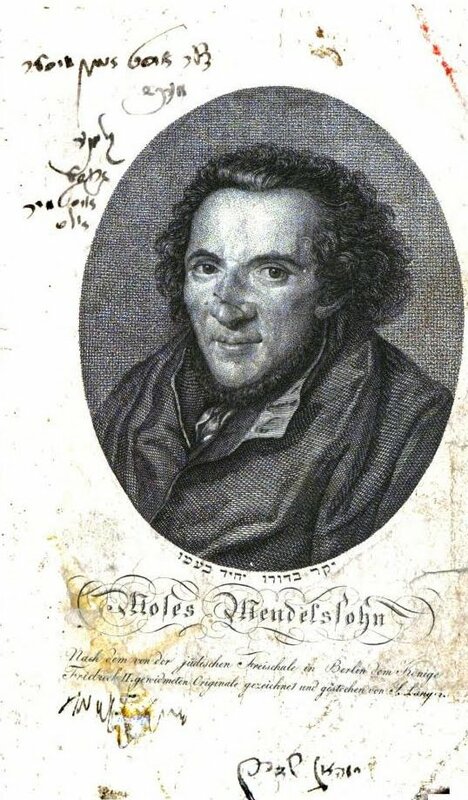 In it's own way, the Nesher Hagadol's own handwriting is famous just like his alleged visage (on his portrait, see here and here). Now, this particular piece is very special. It says "Corrected from my copy. I, Moses ben Rabbi Maimon z"l (at least z"l is what it may say - some assume it says zatza"l and others zaqa"l; I read it almost certainly as a tzade). This is found at the very end of the Huntington Manuscript 80 (Ms. Hunt. 80) owned by the Bodleian Library at Oxford. There is now an entire website dedicated to displaying this precious manuscript which was personally reviewed by Maimonides. (link). 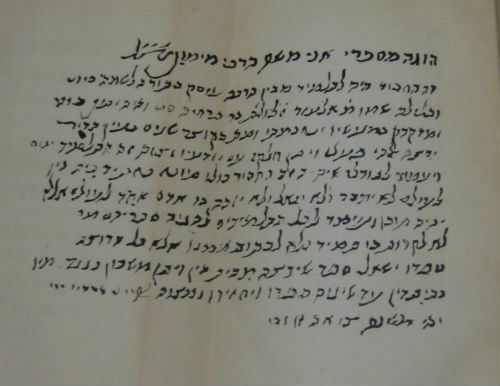 "Four or five autograph letters of [Maimonides] have been found in the Fostat Genizah. One is a genuine twelfth century שו"ת, i.e., "question and answer." We have come a long way in 105 years! Needless to say, there are things we take for granted. How fortunate are we that we can sit in our own home, with a bowl of Cheerios at our side, and look over something as mind blowing as this! Interesting times - which is not necessarily a curse. It really was not so long ago where most people did not have access to such things, and even the people who did have access, only had access to the things in their own grasp. To see a snippet of writing by the Rambam? This was a rare, almost impossible sight. I will describe when and how and why this changed below. "The Hebrew collection in the British Museum forms one of the greatest centres of Jewish thought. It is only surpassed by the treasures which are contained in the Bodleian Library at Oxford. The fame of these magnificent collections has spread far and wide. It has penetrated into the remotest countries, and even the Bachurim (alumni) of some obscure place in Poland, who otherwise neither care nor know anything about British civilisation, have a dim notion of the nature of these mines of Jewish learning. All sorts of legends circulate amongst them about the "millions" of books which belong to the " Queen of England." They speak mysteriously of an autograph copy of the Book of Proverbs, presented to the Queen of Sheba on the occasion of her visit to Jerusalem, and brought by the English troops as a trophy from their visit to Abyssinia, which is still ruled by the descendants of that famous lady. 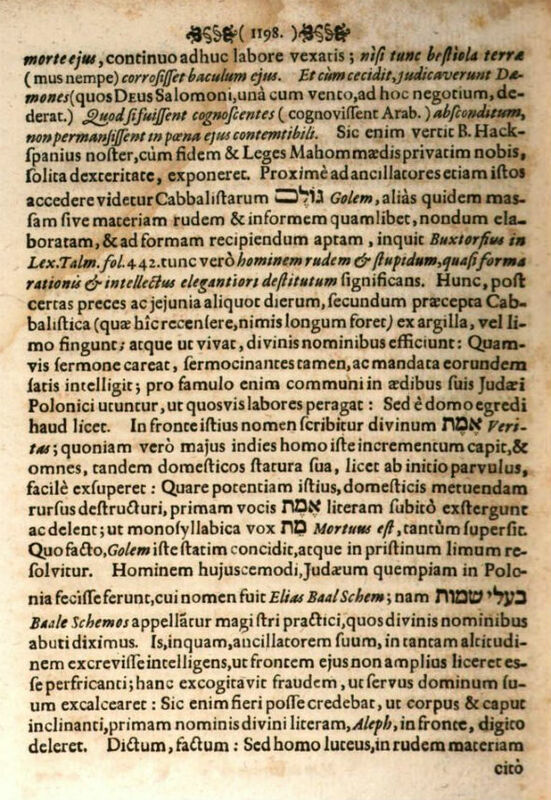 They also talk of a copy of the Talmud of Jerusalem which once belonged to Titus, afterwards to a Pope, was presented by the latter to a Russian Czar, and taken away from him by the English in the Crimean war; of a manuscript of the book Light is Sown} which is so large that no shelf can hold it, and which therefore hangs on iron chains. How they long to have a glance at these precious things! Would not a man get wiser only by looking at the autograph of the wisest of men? 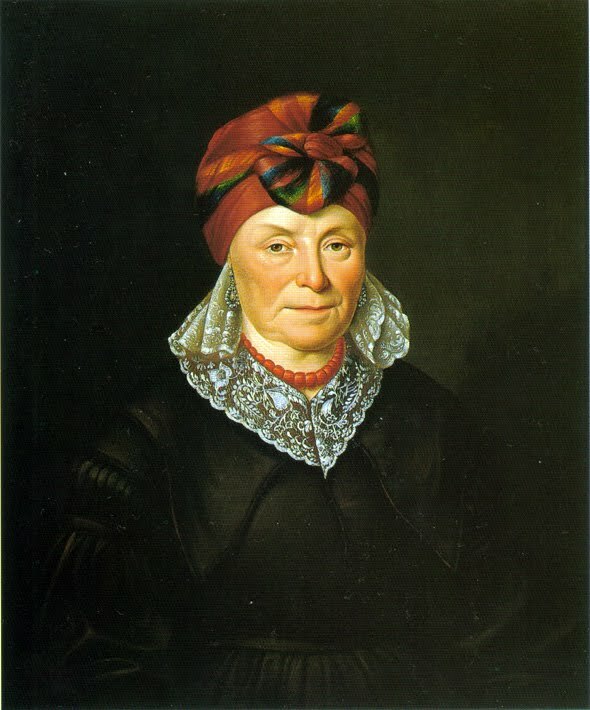 But even the students of Germany and Austria, who are inaccessible to such fables, and by the aid of Zedner's, Steinschneider's, and Neubauer's catalogues have a fair notion of our libraries, cherish the belief that they would gain in scholarship and wisdom by examining these grand collections. How often have I been asked by Jewish students abroad: "Have you really been to the British Museum? Have you really seen this or that rare book or manuscript? Had you not great difficulties in seeing them? Is not the place where these heaps of jewels are treasured up always crowded by students and visitors?" However, the Bodleian was already in possession of Hebrew treasures. Two such treasures were Rambam manuscripts acquired by Sir Robert Huntington in Aleppo, Syria in the late 17th century. One is a manuscript of the Perush Ha-mishnayot written by Maimonides himself! (In Arabic, so it's the Kitab as-Siraj) The other is a very special codex containing Sefer Madda and Ahavah of the Mishneh Torah. This is Ms. Hunt. 80, and it contains the Rambam's own seal of approval. Apparently these were sold to Huntington by the Rambam's own descendents. As you can see, he writes that he "searched in the correct manuscripts which were checked according to the book checked with the Rabbi's own book, that is in Aleppo." 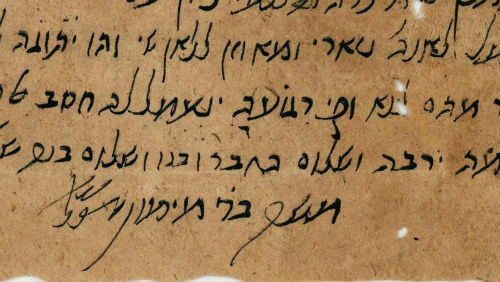 Thus it sounds like even in Egypt, where he lived, there were copies circulating which was checked from this very manuscript, known to have been approved by the Rambam himself. Note: he says that Huntington acquired it in Cairo. This is, I believe, a mistake. In any case, here is the fac-simile that is given for the first time ever, in the Hebrew section. 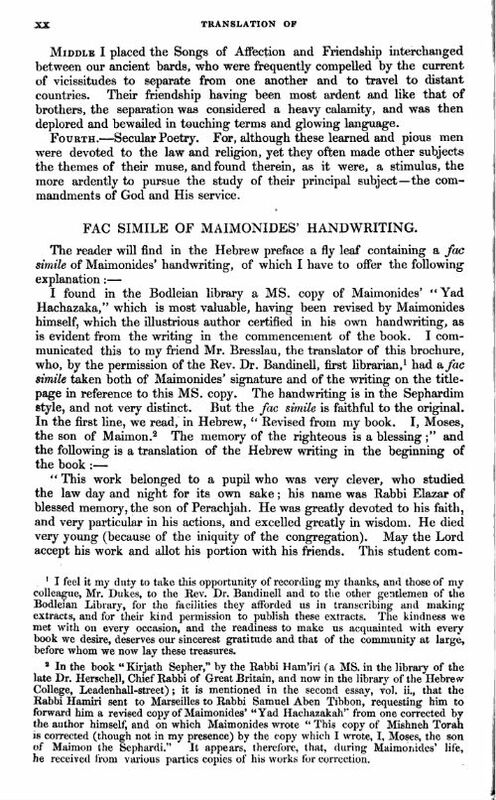 As you could see above, Edelmann explained that he noticed the signature and asked Bresslau to request from the librarian Bandinell that they be allowed to make a facsimile (presumably Edelmann didn't speak English). The translation is pretty faithful, but not exact. 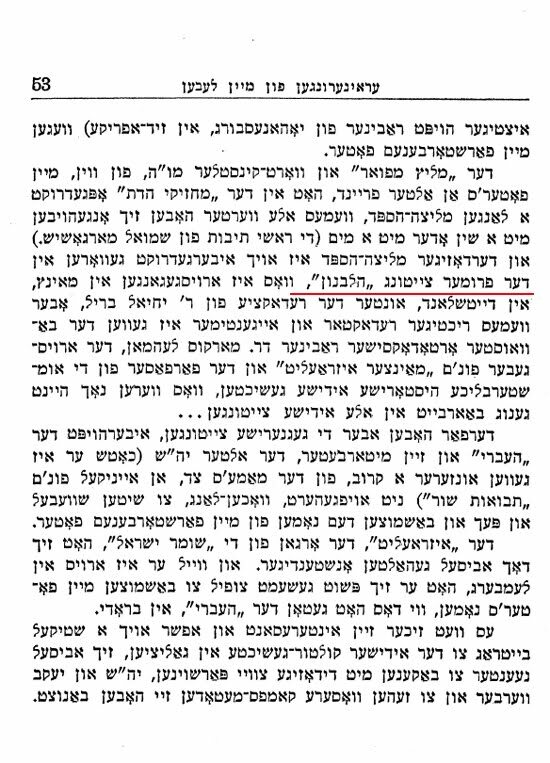 Since I am always going on about the ס"ט acronym, note that the Rambam doesn't merely mention "Rabbi Elazar of blessed memory, the son of Perachjah." He writes "מ' אלעזר ז"ל ול"ת בר פרחיה ס"ט." 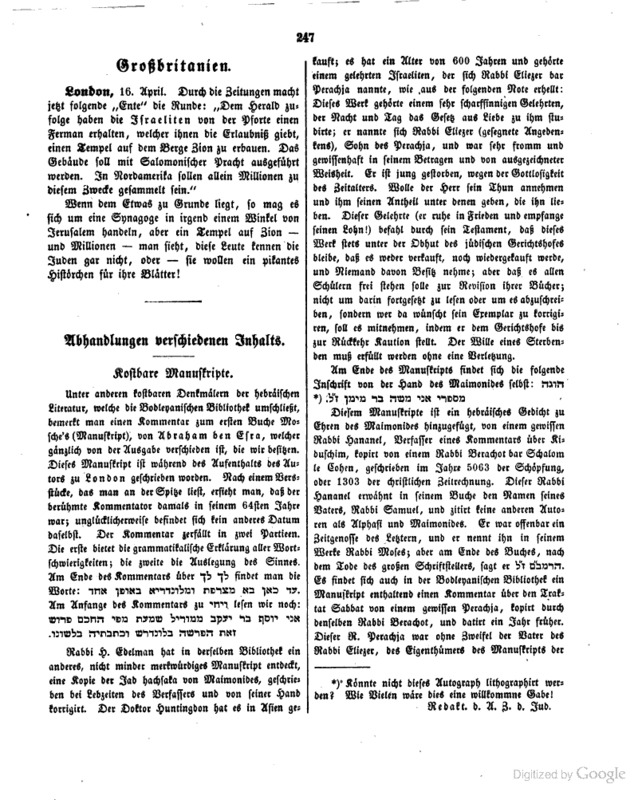 While Ginze Oxford was published in 1851, apparently Edelmann had not kept it a secret, for already in the April 22, 1850 issue of the Allgemeine Zeitung des Judenthums there is an article about it. In a footnote, the editor hopefully asks "Koennte nicht dieses autograph lithographirt werden? Wie Diesen waere dies eine willkommne Gabe!/ Might not this autograph be lithographed? That would be a welcome gift!" So Edelmann obliged. 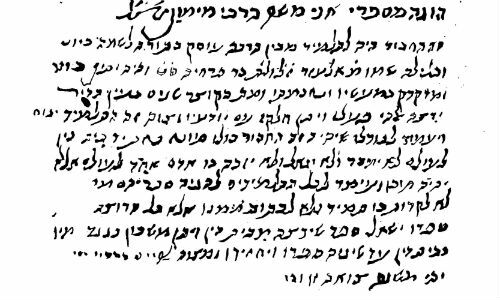 Actually, this particular signature, as produced in this sefer, even became used as a source in a certain valuable book on names for gittin, but I won't get into that since that is for another post in the works. A frustrating example of how Google Books messes up - too frequently - with no evident plans to correct these errors. I thought it was from volume 12 (1904) but now I'm not sure. It includes a snippet of text from his Moreh Nevukhim, and it post-dates the Cairo Genizah. It would still be nice to own it, but it is no longer necessary. Viva democracia digital! 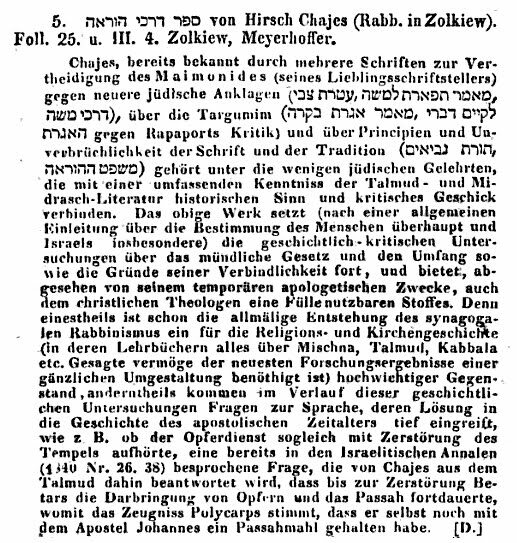 Here's Franz Delitzsch's review of Darkhei Hora'ah by Rabbi Zvi Hirsch Chajes, for Rudelbach's Zeitschrift für die gesammte lutherische Theologie und Kirche (1844). 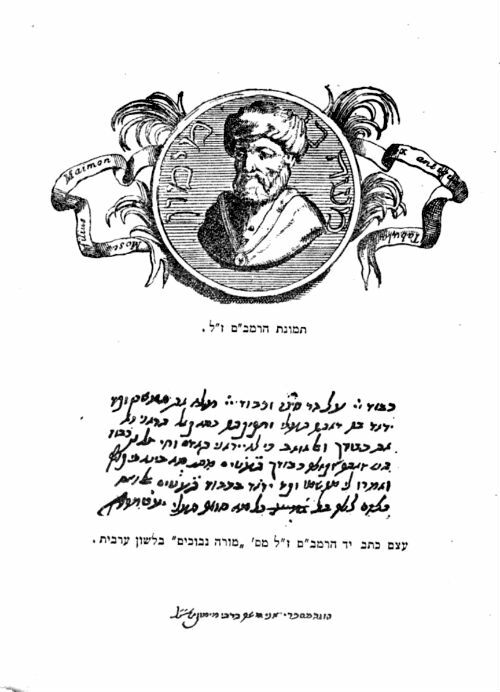 Chajes, known already for several books defending Maimonides (his favorite writer) against recent Jewish aspersions (מאמר תפארת למשה, עטרת צבי, דרכי משה), on the Targums (לקיים דברי אגרת, אגרת בקרת for Rapoport's review) and on the principles and inviolability of Scripture and Tradition (תורת הנביאים, משפט ההוראה) is one of a few Jewish scholars who combines a comprehensive knowledge of the Talmud and midrashic literature with a historical sense and critical skill. The aforementioned work is (after a general prologue on the purpose of man in general and Israel in particular) a historical-critical study of the Oral Law, its extent, and the reasons for its continuing bindingness. He offers, apart for its ephemeral apologetic aspect, an abundance of material useful even for Christian theologians. Because the gradual formation of the rabbinic Synagogue is an important subject for religious and Church history, and partly depends on linguistic studies, some solutions for questions in the history of the Apostolic period depend upon such as when the Temple sacrifices ceased; usually thought to be immediately with the destruction of the Temple. 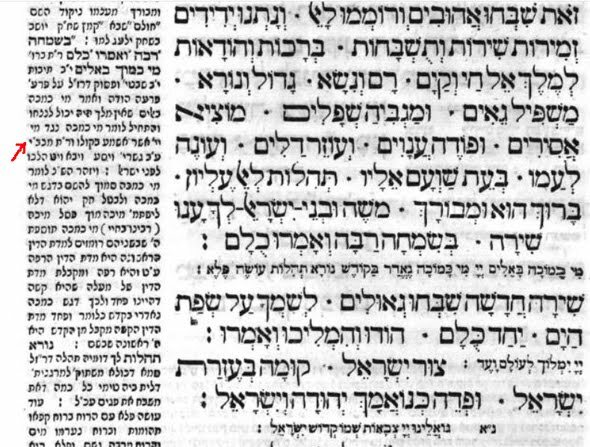 Chajes, discussing the question in the Israelitische Annalen (1840 26 38), answers using the Talmud, that the offering of sacrifices and the Passover sacrifice continued until the destruction of Betar. This confirms the testimony of Polycarp, that he kept a Passover with the Apostle John. I haven't done an Artscroll oriented post in a while. I shared this list with someone whom I thought would be interested, and do something with it, but he urged me to post it myself. Shavuos machzor, pg. 226, they write "The piyutim [known as kerovos]," which is subtly a change from their normal policy of explaining it is kerovotz, a notarikon for קול רינה וישועה באהלי צדיקים. pg, 232, it actually cites the midrash that anokhi is an Egyptian word ("closely resembled the parallel word in Egyptian") and "this Midrash apparently disagrees with the Midrashic teaching that the Jews in Egypt retained their Hebrew language and did not adopt Egyptian." !!! But then you turn to pg. 265 (beit yaakov meam loez) and the comment says "Even the Jews who were forced to communicate with the Egyptians in the language of the land did so only under duress. Among themselves, however, they spoke only the Holy Tongue and regarded Egyptian as a foreign language." Note the source cited - none. In the machzor's Ruth, it bizarrely quotes from the Torah Temima (pg. 527) to explain why Ruth says "na'arim" while Boaz said "na'arot. "As a Moabite, Ruth was not intimately familiar with Hebrew differentiations between the masculine and feminine forms. In the Moabite language (! ), like English, most nouns did not have separate male and female forms. Ruth mistakenly used the masculine without meaning to be suggestive, because, as the Midrash interprets 'She was a Moabite!' Naomi tactfully corrected her mistake [next verse]." 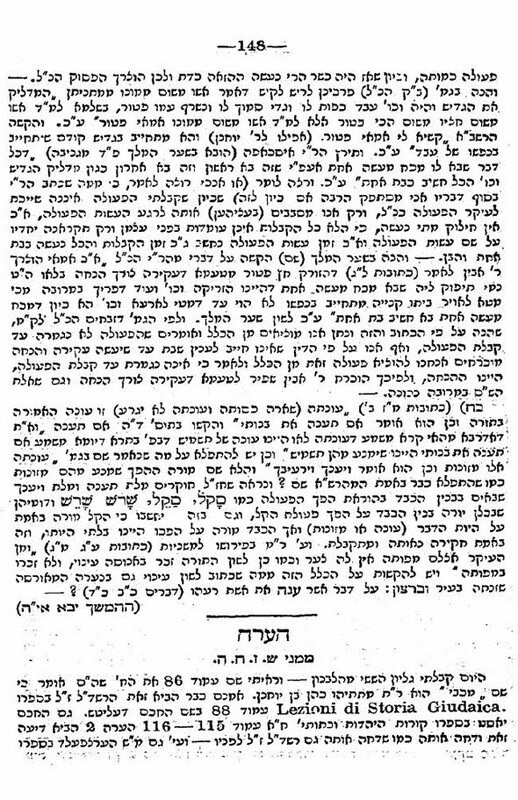 Rosh Hashana machzor, pg 156. 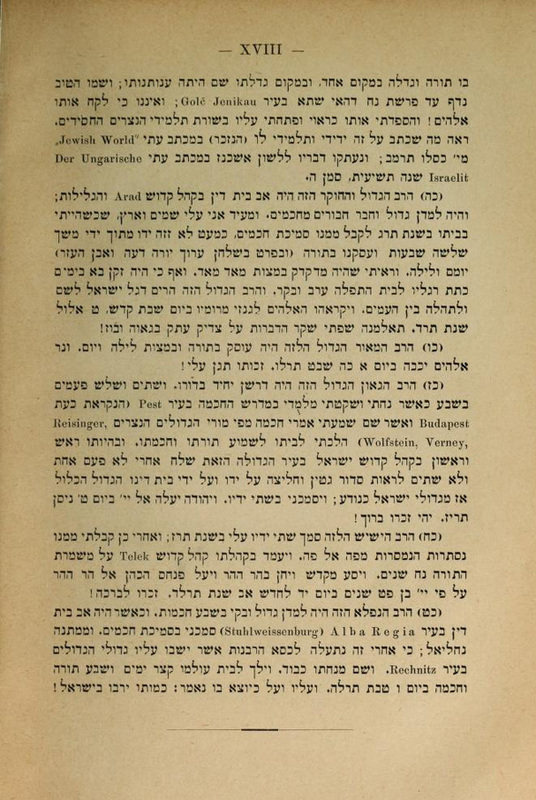 After explaining Yigdal, it says "They comprise the basic principles of the Jewish faith. In Rambam's view, to deny any of them constitutes heresy. pg. 450 it explains that "the Prophets are of a higher order of holiness than the Writings - for the Prophets are the word of God while the Writings are direct prophecies" - what does that mean? pg. 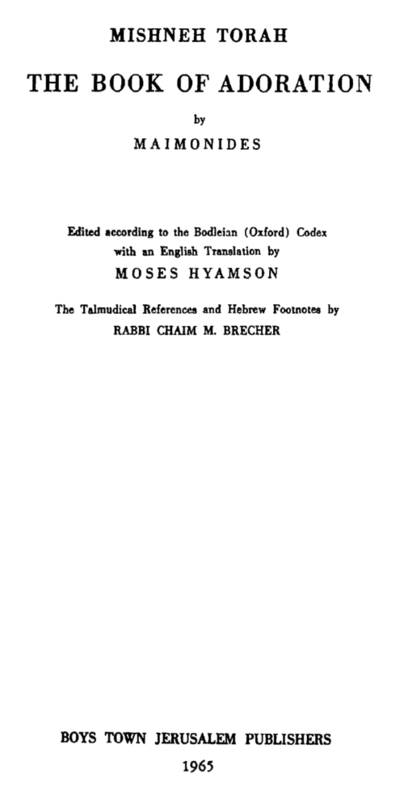 477, Kalonymos ben Meshullam is described as "a great Talmudic and Kabbalistic scholar." Yom kippur machzor, pg. 60 on Kol Nidrei "two explanations are offered, one rational and one Kabbalistic"
Pg. 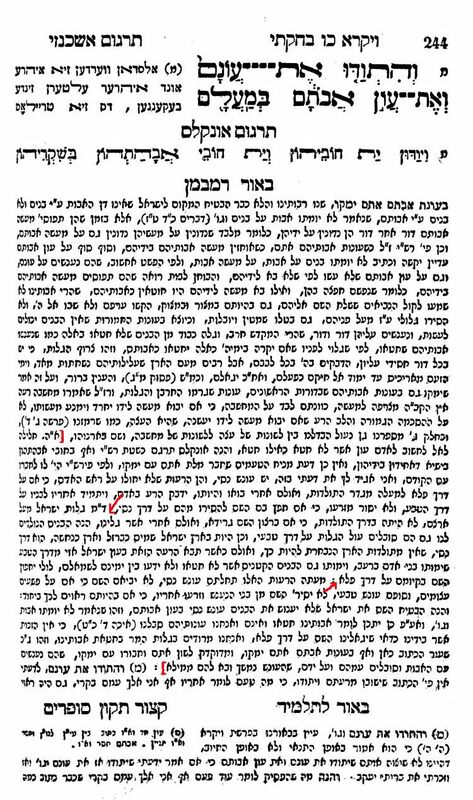 175, it admits that the authorship of Shir Hayichud is "uncertain," but "the general consensus is that it was composed by R' Shmuel bar Klonymos" They then refer to Maharal, Emden, Heidenheim and Baer. That is, they entirely omit any mention of the fact that far from there being a "general consensus," there was a major controversy about the Shir Hayichud. Some thought it was written by a Karaite, and others by a Christian monk named Michael Basilios. And when I say "some," I don't mean "Zunz." 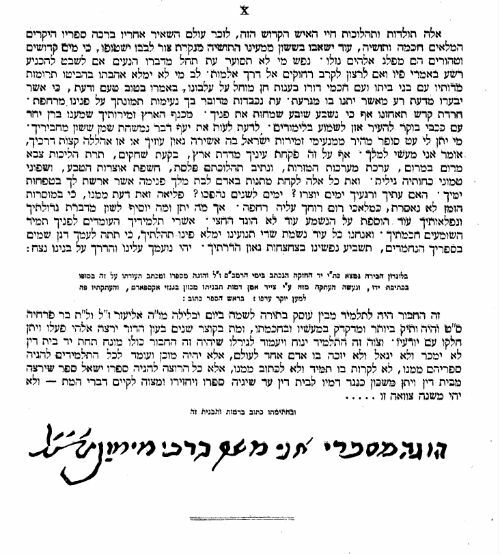 Even the Vilna Gaon reputedly subscribed to the view that the author was Michael Basilos (מכאל בזלוש). They mention the Maharal, but not that he was against saying it! Pg 205 - maybe the most amazing thing yet - they explain that "Scripture in those days was unvowelized (like our Torah scrolls)." But see pg. 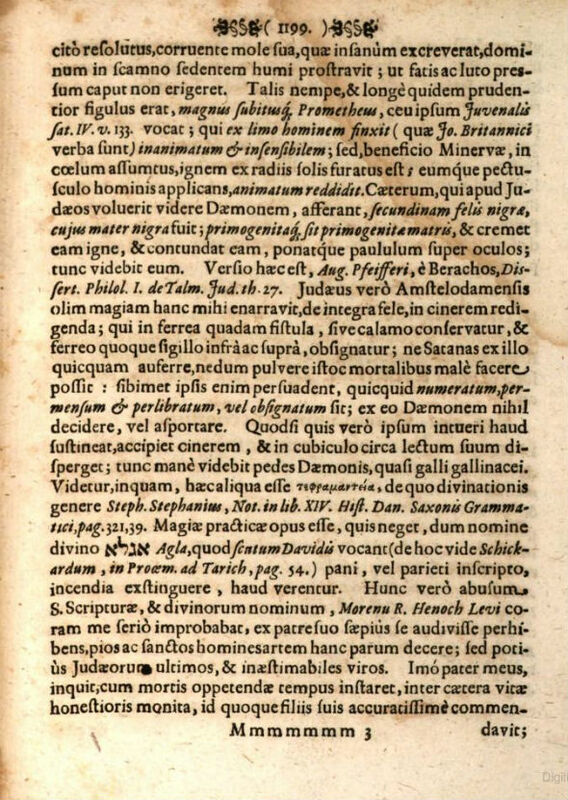 61 of The Early Achronim, where it says that "In the preface to [Mesores HaMesores] R' Eliyahu [Bachur] presented his assertion that the punctuation marks used to indicate the vowels are not of Sinaitic origin and had been introduced by the Tiberian Massoretes in post-Talmudic times. This raised a great controversy in rabbinic circles and R' Eliyahu's view was not accepted. Pg. 532, for some random reason they decided to quote the Arukh about the meaning of "Kalir," who "became wise as a result of eating a cake upon which certain kabbalistic formulas had been inscribed." 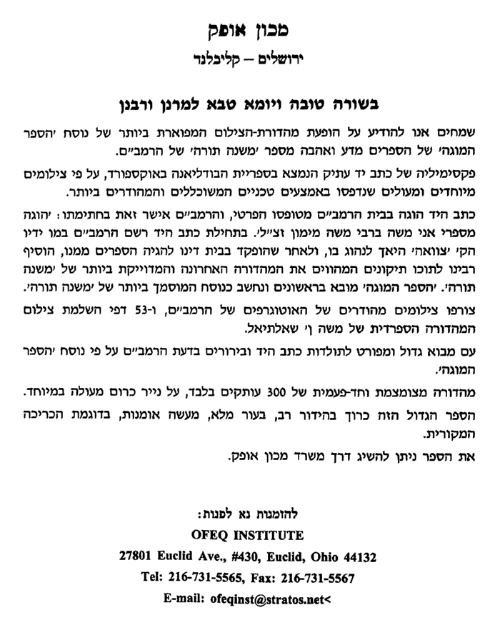 I'm sure this will edify all the masses in Peoria who bought Artscroll machzorim. 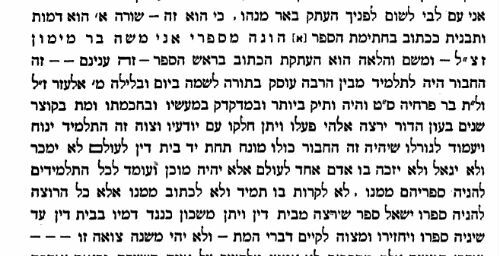 Finally, a general comment, that their "infinitely more than inspired poetry" line about the piyutim seems to be a direct response to Birnbaum, who wrote that Kalir's "numerous prayer-poems" were "imitated by inspired payyetanim on succeeding generations." As for why one book contradicts another, I guess this is probably because of the actual complexity of the tradition. If there is an attempt to keep a unified position, this can break down in the details. What did Rebbetzin Chorin wear on her head? Here is an interesting, and unexpected reference, to Rabbi Aharon Chorin, in Solomon Schiller-Szinnessy's edition of the Radak to Psalms (Cambridge 1883). Hm. Probably not what one would expect. These two portraits come from Grace Cohen Grossman's Romance & Ritual: Celebrating the Jewish Wedding. Since we see how his wife covered her hair (actually in all likelihood, there's no hair under that) it's worth mentioning an anecdote I posted about earlier, at the beginning of this post. I honestly have no idea how to square all these circles. The Responsa in English controversy of 1966. 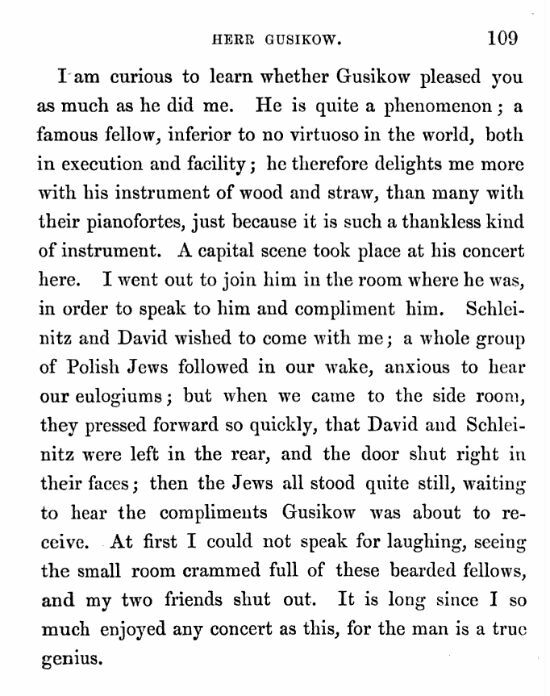 Unexpected experiences in Jewish Berlin, 1860. So what's up with 'Shamshon'? Sliding to the Right in Denmark in 1909.